This collection brings together a range of international historians and educationalists interested in the future of history education. The book is designed to provide a clear and critical account of recent initiatives in the teaching of history, in order to stimulate debate on the current scope and nature of history, and its enhancement and development. It also provides practical information and assistance for those wishing to refresh their own thinking in the light of recent research into teaching and learning. Alan Booth is Lecturer in History at the University of Nottingham. Paul Hyland is Head of the School of History at Bath College of Higher Education. 1. Introduction: Alan Booth (University of Nottingham) and Paul Hyland (Bath College of Higher Education). 2. Planning a History Curriculum: Alex Cowan (University of Northumbria). 3. Race in a World of Overlapping Diasporas: the History Curriculum: Earl Lewis and Jeanne Theoharis (University of Michigan). 4. Gender in the Curriculum: Cathy Lubelska (University of Central Lancashire). 5. Teaching History Theory: A Radical Introduction: Keith Jenkins (Chichester Institute of Higher Education). Part II: Reviewing Traditional Methods:. 6. Teaching and Learning in Lectures: Peter N. Stearns (Carnegie Mellon University). 7. Seminars for Active Learning: George Preston (Bath College of Higher Education). 8. Measuring and Improving the Quality of Teaching: Paul Hyland (Bath College of Higher Education). Part III: Teaching with Multi-Media:. 9. Computer-Assisted Teaching and Learning: Donald A. Spaeth (University of Glasgow). 10. Structured Distance Teaching: Arthur Marwick (Open University). 11. Teaching and Learning through the Visual Media: John Ramsden (Queen Mary and Westfield College). Part IV:Linking History with Society:. 12. History and the Community: Michael Winstanley (University of Lancaster). 13. Learning from Experience: Field Trips and Work Placements: Christine Hallas (University of Leeds). 14. 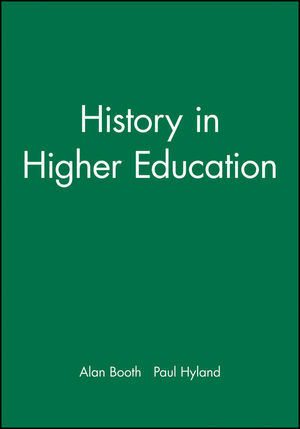 History, the Curriculum and Graduate Employment: Peter J. Beck (Kingston University). Part V: Assessment and Quality:. 15. Changing Assessment to Improve Learning: Alan Booth (University of Nottingham). 16. Assessing Group Work: Alan Booth (University of Nottingham). 17. Assessing the Quality of Education in History Departments: George Brown (University of Nottingham). Includes articles on race, gender, distance learning and multi-media use.